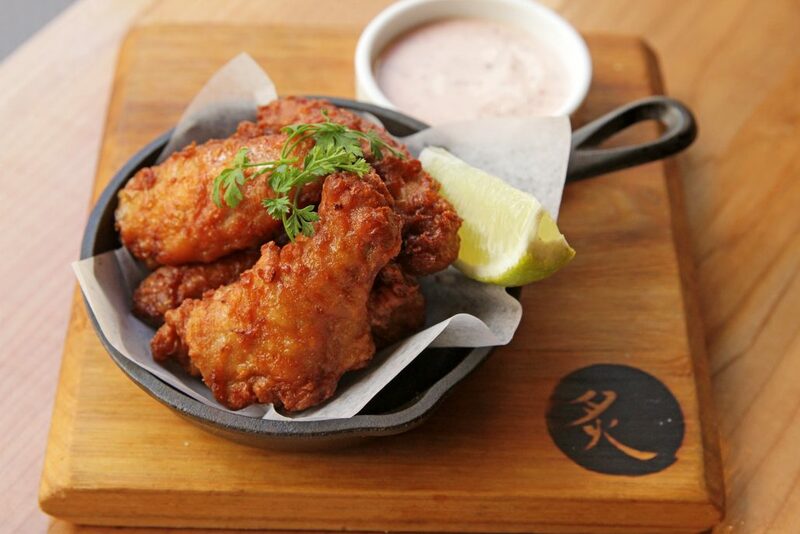 At Gyoza Bar, our menu focuses on conventional Japanese comfort food with an innovative twist. Inspired by the diversity of Vancouver, we created a menu that integrates international flavours with traditional recipes. Here you can find all your classic favourites such as the Pork Teppan Gyoza and Tamari-Shoyu Tonkotsu Pork ramen. You can also try our more creative items such as the Korean Spiced Pork Rib Bao Board and the Lettuce Wrapped Crispy Chicken Taco. We have also crafted vegetarian options for our signature dishes so that diners of all diets can enjoy our comfort cuisine. This includes our Roasted Beet Gyoza + Market Salad and Umami-Shoyu Market Vegetable Ramen. Our lunch menu is perfect for a quick meal before heading back to work, while our dinner menu is created for a shared dining experience. Enjoy our gyoza paired with wine or beer on tap, and unwind with your friends or family in our casual, rustic atmosphere. 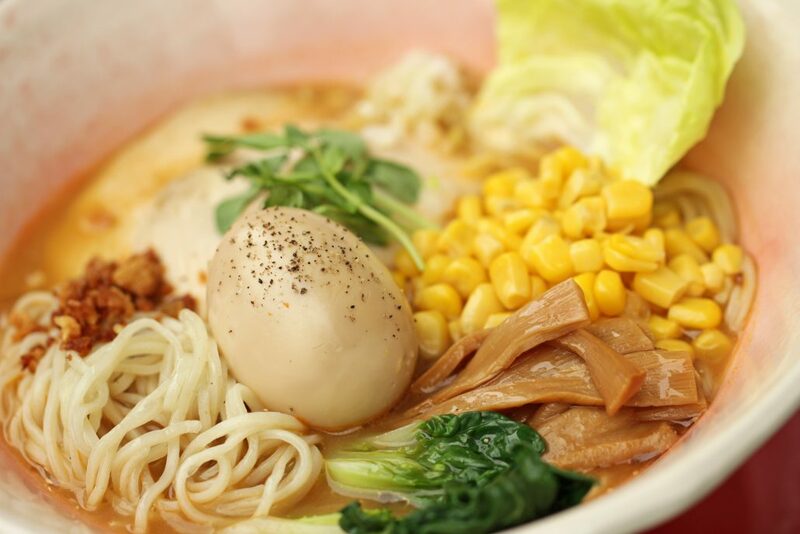 What makes our ramen different? Our chefs use the best quality cuts to create broth of optimal flavour. Our long simmering times adds richness to our broth. Our commitment to not using MSG has a flavour enhancer leaves you satisfied instead of sick, and you are also not left dehydrated. Tare is added to our signature broth to create the Shio (Salt) or Shoyu (Soy) flavour. This is how we build a flavourful broth without MSG. Our chefs use a signature blend of premium salts and soy with other complements to enhance the broth. We make our own flavoured oils in house. It is common practice to use the oil collected from boiling the protein (usually pork), however this can create a “muddy” flavour to the broth because of the impurities that come out of the meat during the cooking process. At Gyoza Bar, we remove this protein oil form our soup and add our own flavoured oil. This acts as an insulator to retain the heat of the ramen, and the oil carries the flavour of the soup over the noodles and your palate, further enhancing your ramen enjoyment. Our noodles are designed around the Japanese concept of Koshi, the perfect texture with a slightly al-dente bite. Crafted using a special blend of Canadian flours in our signature square-straight shape, our koshi noodles complete the full Gyoza Bar ramen experience. Combining these four core components of ramen into one hearty bowl, our exceptional dish will have you calling out for kaedama (another serving!). Our unique take on this age-old Japanese comfort food adds to our core Aburi philosophy of innovating traditional cuisine and localizing international flavours. What makes our gyoza different? What sets our gyoza apart from others is our cooking method. 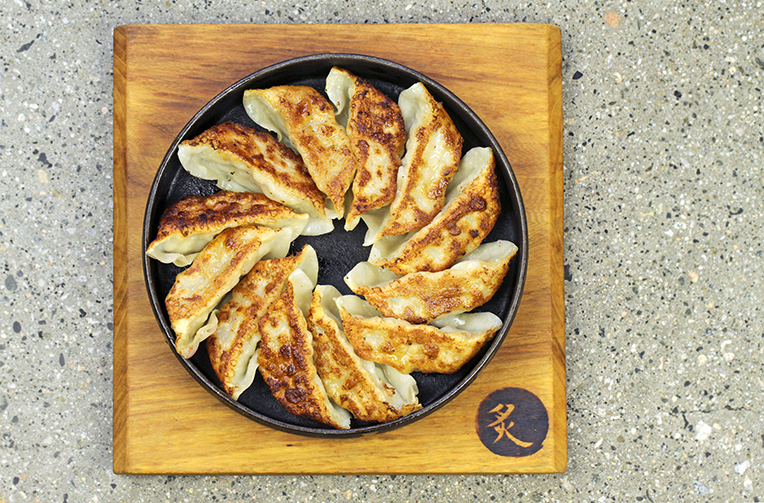 We serve our gyoza in traditional Japanese imono cast iron pans to achieve a perfectly seared and crunchy texture on the outside while locking in the juices of the filling on the inside. This cooking technique makes for the remarkable texture and deep flavour in our signature dish. 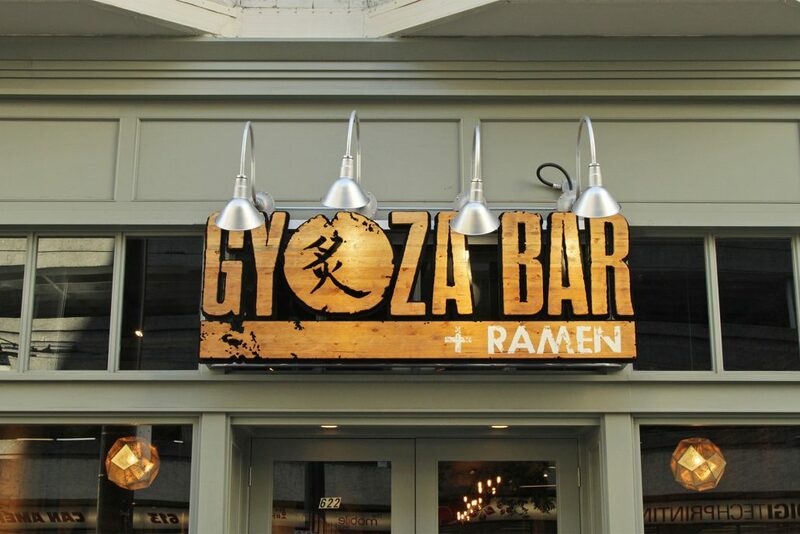 Experience our gyoza and ramen today!